From a child's perspective, school, extracurricular activities and home are part of the continuous experience of life. From the perspective of teachers, coaches and parents, those experiences may seem more differentiated and are thus treated separately. 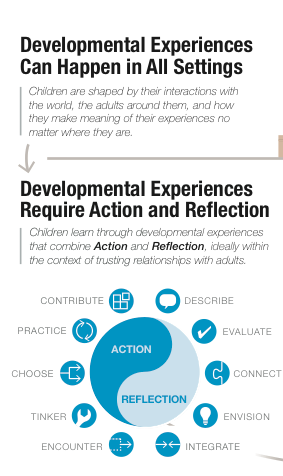 However, if the adults in a child’s life approach his or her growth as a collaboration following a clear developmental path, every child will have a better chance at a life filled with choices and the skills to achieve goals, according to a report. 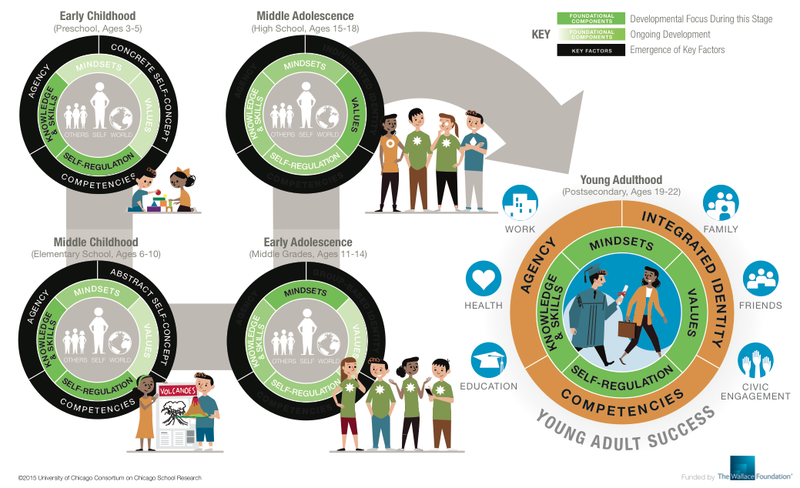 “The idea is that if everybody starts to have a common understanding about what they’re trying to do and what an effective approach would be, and they understand that it’s a shared responsibility to help kids develop and learn over time, then hopefully it will lead to more discussion,” said Jenny Nagaoka, lead author of the Foundations for Young Adult Success: A Developmental Framework and deputy director of the University of Chicago Consortium on Chicago School Research (CCSR). “Kids will be engaged in learning and internalize the academic side if you are also helping them work to develop in multiple ways,” she said. Engagement doesn’t come only from exciting content, but from a student’s own ability to self regulate, apply skills and find some relevance in the lesson. The CCSR report makes the case for better integrating aspects of a child’s development using a compilation of developmental psychology, neuroscience, sociology and education research perspectives. By combining insights from each of these areas, the report’s authors strive to paint a clearer picture of how to support development of the intangible qualities underlying both the cognitive and non-cognitive skills emphasized in school, clubs and at home. The report identified three “key factors” that young people need to be successful. Many programs that focus on closing the equity gap only address educational attainment. But through research and interviews with both experts and youth, the CCSR researchers have developed a broader definition of success that includes young people becoming aware of themselves and the wide range options available to them, while developing the competencies to pursue those options and make good decisions as citizens of the world. It can be harder for young people coming from marginalized communities to develop a strong sense of agency when faced by factors like violence or a lack of experiences that allow them to try on and experiment with new identities. However, adults working with those young people should recognize the importance of developing agency and give them opportunities to try it out when the stakes are low. Integrated Identity: The process of getting to know oneself happens throughout childhood and into early adulthood and plays an especially important role in the teenage years. Forming an identity is some combination of discovery, construction and creation, but at its core it is a process of figuring out one’s beliefs, values, goals and experiences. All humans are multifaceted, but integrating an identity is about fully inhabiting all sides of the self. This process can be more challenging for kids coming from disadvantaged communities where the coping mechanisms that work at home may not transition well into school or work environments. School often reflects a dominant white, middle-class culture, forcing kids who don’t come from that background to make a bigger lift when integrating their identities. This is profoundly unfair to kids coming from a different background from the dominant one, as it presents a whole other set of values and beliefs that must be incorporated into the sense of self. Competencies: The report notes that the ability to perform roles, complete complex tasks and achieve specific objectives requires a set of competencies that include things like interpersonal skills and critical thinking skills. To some extent, the competencies a person may need will depend on what path in life they choose. All of these factors play an underlying role in determining how successful a child will turn out to be. Additionally, four components underlie all cognitive and non-cognitive learning: self-regulation, knowledge and skills, mindsets and values. Researchers note these components are malleable and can be easily influenced by experiences and relationships. They are also more or less important at different stages of a child’s development. 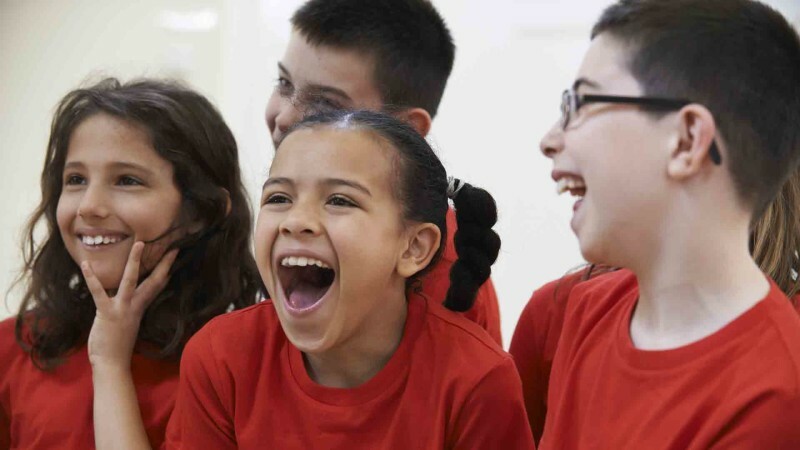 For example, 12-year-olds are very oriented towards identity, groups and finding a sense of comfort in friends, while older adolescents are often questioning their identity, looking to differentiate themselves. “If teachers can tap into that place, they can engage students more effectively,” Nagaoka said. Early childhood educators often think about children in this holistic way, paying attention to social and emotional skills in addition to things like recognizing letters and numbers. Often this practice is dropped when a child turns from five to six and enters the first grade, even though developmentally, that child could still use those supports. That’s where the network of adults around that child could better integrate their supportive efforts. While this report attempts to draw together disparate areas of research to offer a more complete picture of how children develop and use resources, relationships and experiences around them to make their way in the world, there are some clear ways that parents, educators and policymakers could integrate this holistic view. Educators need a developmental lens: Too often, structures and practices are at odds with the developmental states of the children they are meant to serve. Schools and even parents are often more oriented towards the needs of adult - such as discipline and quiet - than towards what works for kids. All kids need access to rich opportunities: At almost every step of the way kids from marginalized communities face more challenges to becoming successful adults than kids from wealthier and better educated homes. Adults need to help young people develop the skills and dispositions to cope with the world as it is, while helping them build the courage to change the status quo. “Narrowing the focus onto one thing is a lot easier than saying there’s a lot of things we need to be paying attention to,” Nagaoka said. Schools must be safe places for educators: “In the current state of things, schools are not particularly safe places for teachers to be experimenting or practicing or doing something they don’t know for sure will work,” Nagaoka said. There’s no clear roadmap of practices and policies to ensure the kind of holistic education this report is advocating. It will take trial and error. “Adults learn and grow and organizations improve by being allowed to make mistakes and overcome them and learn from them,” Nagaoka said. If this is the advice we are giving students about their learning, it only makes sense to allow educators the same growthful stance and professional agency. Be careful measuring non-cognitive factors: Many school districts are realizing that non-cognitive factors are important to success, but the immediate instinct has been to try and quantify those things. The report’s authors caution that course of action, noting that in many cases the factors aren’t compatible with a standardized test-based accountability system. “It’s more about understanding where kids are and understanding where kids need more support,” Nagaoka said. There’s no “right place” for a seven-year-old to be on the self-actualizing scale. Nagaoka suggests more diagnostic or formative assessment tools for evaluating how a student’s noncognitive abilities are developing. Learning happens throughout life, not just at school. The daily real-world experiences are often much more potent and lead some students to question the value of what they are taught in school. If educators don’t address that disconnect and help students to reconcile those implicit messages with the values of school, those students may get lost. “We’re trying to shift the narrative and helping people see the commonalities in what they’re working on,” Nagaoka said. She suggests that developmental psychology should be a part of all teacher training programs and hopes that there will be more cross-pollination among educators about how to support kids’ growth.